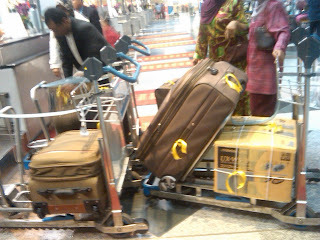 My elder brother and his family went off to Bristol in United Kingdom last Thursday. As it was quite a while since anyone go off to study within our family, there was quite a crowd sending them off. He was not as sad as he was first send off somewhere when he was younger. I remembered he even cried when he was sent off to boarding school. He was 13 then. Then he furthered his study in USA and he then became a seasoned traveller. As for me, I rarely tell my parents where I was going in my globe-trotting days, which is way past. Then, I only go anywhere if I don't have to pay anything. Oh, there are ways to get that and that was another lifetime ago. I don't do that anymore. Nowadays, all my travel is paid for by myself and for my own pleasure. The one who has a reason going to Bristol is my sister-in-law. She is furthering her study. She is an English teacher with a Masters from a local university. So, I guess she is going to Bristol to do a PhD in English? Anyway, they went there with my niece and nephews. 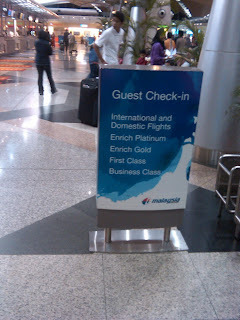 There are 5 of them and as my SIL is qualified, they all got to travel in business class. Lucky them! They will be there for 4 years (unless they suddenly migrate there) and that will mean my siblings will be less one during Eid Mubarak next year. With only 3 of us, that will be a small gathering indeed.